The tests on Mets shortstop Jose Reyes came back last night, and they were positive, in both definitions of the word ... depending on to whom you talk. The Mets say Reyes indeed has an overactive thyroid, but, barring something going terribly wrong (which of course never happens with Reyes), it shouldn't be a prolonged injury. Though we hear that a lot. Not that Reyes is down with any of this. The specialists who took care of me in New York have told me that I'm fine and that there's nothing wrong with my thyroid. The test [taken to follow one conducted during his physical] showed that I'm fine. We just have to wait for the results of the additional test. The [doctors] found inflammation in my throat and no medicine to treat the thyroid or any other condition has been prescribed." So, here we go again. One thing everyone does agree on: He won't be able to play until at least Friday, when there are some additional tests coming back. Reyes says he'll play then; the Mets aren't so sure. Just to be safe: Plan on next Monday — and expect next month. By the way, if Reyes does have the thyroid problem, the usual prescription involves radioactive iodine, a substance we had no idea existed. To quote the Daily News story: "Patients are handed a card explaining the radioactive treatment since they could set off an alarm at an airport or subway stop." 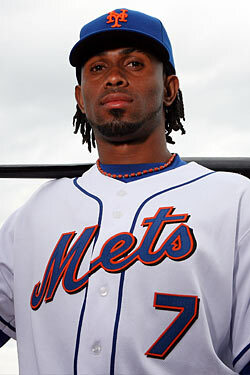 It would be rather neat if the Mets had a glowing shortstop.